What does it take to get Sleeping Beauty to the chapel on time? A lot! I spent the weekend with Sleeping Beauty’s Ladies in Waiting, also known as the Costume Crew of Baton Rouge Ballet Theatre, as they prepped for Act III of Sleeping Beauty, the Royal Wedding. 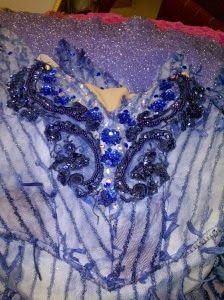 Princess Aurora’s guests, classic fairy-tale characters, will be fitted, accessorized, and stage ready for the wedding. Like all wedding guests, the White Cat, Blue Bird, Little Red Riding Hood, and Lilac Fairy, needed something new before the nuptials. Known as Blue Bird, this classic tutu awaits its review by BRBT’s Costume Mistress Polly Normand. The character’s clothing, tutus in white, blue, and purple, wait for inspection from Costume Mistress Polly Normand. She will review each one for beading, closures, fabric, and other needs prior to royal wedding performance. Baton Rouge Ballet Theatre’s Costume Crew, volunteers and sewers of all levels, gather like family at the sewing tables and await instructions from Normand. Normand directs the needs of each tutu, and then the room awakens to sewing and stories as the crew visits about weekend trips, families, and upcoming events. The costume crew will spend their weekends in the sewing room adding fabric panels, hooks and eyes, and beading to the costumes. 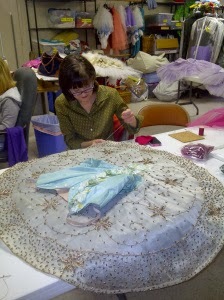 Costume Chairman Ann Farris preps a fairy tutu. She will reinforce the beading of the skirt by hand. “It’s easy but time consuming,” they said. Each crew member will sew two hours to place eight inches of bead work. The beads are sewn by hand and knotted for reinforcement. The skirt of each tutu has approximately 300 inches of bead work to be completed prior to performance. Next, it’s time for the white cats. Normand will give the White Cat and Puss-in-Boots added collars and cuffs of feathers and fur, and their tails will receive extra little grooming for the royal wedding. “Their tails need to be bigger to show better on stage,’ she said as she examined trims for each costume. Next, racks of burgundy tutus for BRBT’s corps de ballet lined the room to receive new corsages of pink, blue, and white. The corsages are pinned into place, then hand stitched onto the bodices. “We pin the flowers first. This way, we know they are secure should we run out of time,” said Ann Farris. The costume crew will create new flower garlands to match the corsages as well as sew pink ribbons onto their ballet shoes to complete the royal wedding look. So what will be the final look for the fairy tale characters? Come see for yourself at the River Center. Baton Rouge Ballet Theatre will perform the Royal Wedding of Princess Aurora on March 14, 7:30 p.m.
Click here to visit the Baton Rouge Ballet Theatre and order tickets! 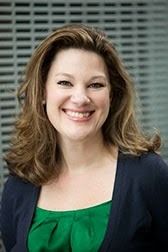 Nancy is a dance and theater enthusiast, a cultural tourist, and a champion of university traditions. Find her at BRAC or Little By Little Events.